This 4 bedroom luxury home is nothing short of spectacular. It sits in a primary forest surrounded by some of the most magnificent trees you will ever see. And that means that there are regular sightings of all kinds of Costa Rican wildlife!! This truly is a nature lovers paradise!! The owner is a US builder and built this home for himself without any thought of resale. That means that everything is “over built” and really high end. From the minute you enter the gates you can tell this because of the paved driveway, fancy retaining walls, and amazing pool and pool deck!! The first floor has 2 bedrooms and a large living room and has access to the pool and to the garage. There is a large attached 2 car garage. The second floor is the main living area with another living room and large kitchen plus 2 more bedrooms. There is a wrap around deck for outdoor living and to take in the view of all of the wildlife that this property has to offer. The pool is beautiful and has a large deck around it plus a covered rancho on one side and a covered yoga deck on the other. The property also has a separate caretaker’s house. The home is located less than a 1/2 km from the coastal highway and a 10 min walk to the beach. For both of these reasons when the house was not owner occupied it was a very successful vacation rental. 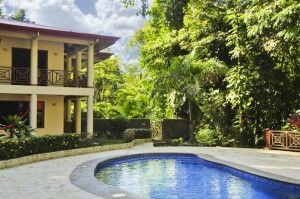 If you are looking for luxury in the jungle than look no further!!! !